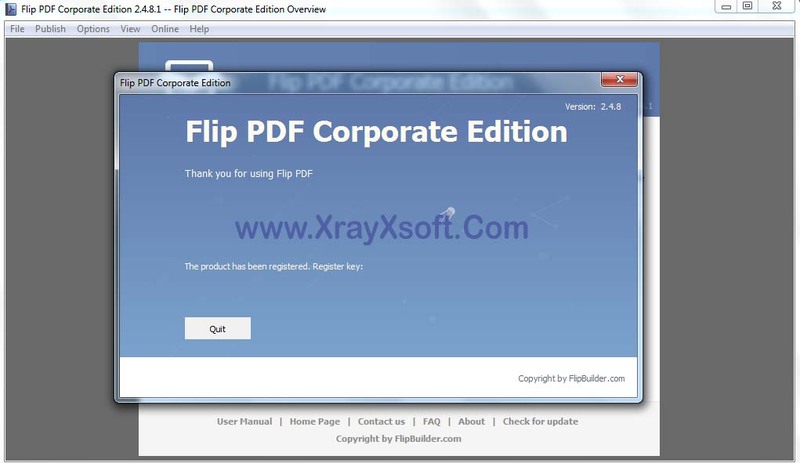 Flip PDF Corporate Edition adalah perangkat lunak Windows yang membantu mengonversi halaman PDF ke halaman digital yang membalik publikasi dengan beberapa fitur canggih. Versi Corporate Edition berisi semua fitur hebat di Flip PDF Professional dan Flip Shopping Catalog. Software Flip PDF Corporate Edition menyediakan semua fitur Katalog Flip PDF Professional dan Flip Shopping, termasuk mode konversi tunggal / batch, baris perintah, multimedia embed, menambahkan keranjang belanja dan animasi harga, mengatur keamanan kata sandi, melacak dengan Google Analytics ID yang disisipkan, menambahkan bookmark , Publikasikan secara langsung, keluaran di HTML, EXE, ZIP, Mac App, FBR, CD, dan versi seluler. Selain itu, Anda bisa langsung menerbitkan flipbook ke server FTP Anda, Email ke pembaca Anda atau buatlah * .scr format flip book untuk digunakan sebagai Screen Saver. Selain itu, Anda bisa mempublikasikan flipbook sebagai plugin WordPress, modul Joomla & Drupal secara langsung. Convert PDF to Adobe© Flash® based page-flipping eBooks. HTML allows you to upload to a website to be viewed online (with title, keywords and other metadata defined). And you can add Google Analytics tracking code to output flipbook pages. EXE allows you to view output book individually on Windows computer. ZIP allows you to output all book files and folders in zip package (easy email and read offline after unzip or read zip with free Flip Reader directly). FBR is especially designed format to read with free Flip Reader, easy email and read offline. Output the flip book as WordPress plugin and insert to WordPress directly. Publish flip book in Joomla module. Create Drupal module to embed to your Drupal site. Download different templates online (//www.flipbuilder.com/templates-themes/). Apply a pre-designed template, animated scene, background and plugin; more free templates, scenes and backgrounds online. Add HTML Title in Float template and click it to visit webpage online. Add new icons into toolbar by calling new actions. Export edited bookmarks as Text file to import and use later. Edit pages with shapes, text, links, images, videos (including YouTube & Vimeo videos) flash or sound files. Export objects added in Page Editor, e.g., links, swf and movies to import and use later. Add Google Analytics to the book pages. Flip book pages by dragging corner, clicking page shadow, scrolling mouse wheel, etc. Use Previous, Next, First or Last buttons or thumbnails to navigate through the book pages. Open and view important pages quickly with pre-loading technology, no need to wait for all pages to load. Flip pages automatically using Auto Flip mode. Add annotation text or shapes to highlight. Download uploaded page-flipping eBook or other file while reading book. Open in the Browser to a specific page by adding a page index to your URL. E.G. www.yourdomain.com/index.html?pageIndex=4. Always show in Minime Style with adding a parameter to URL. E.G. www.yourdomain.com/index.html?alwaysMinimeStyle=true. View page-flipping eBooks in the browser of Mac, PC, iPad, iPhone and Android devices.